One of those hikes where you wish your alarm clock never went off that morning. Left the Coreys trailhead and it was raining. As soon as my wife and I headed up the Calkins brook trail it started snowing. 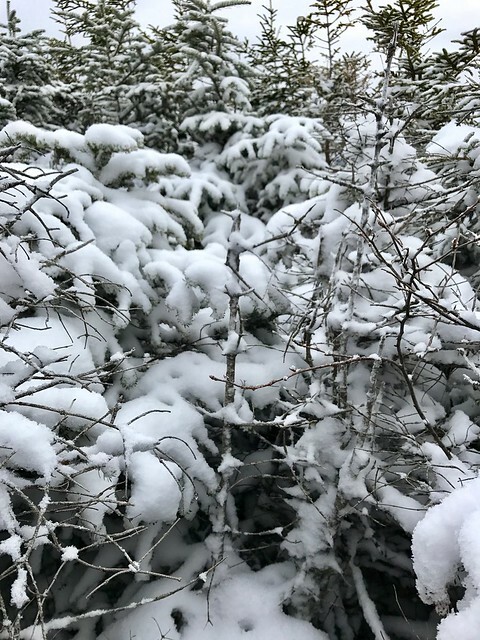 Snow was covering the ground and the conifer boughs all around us. Renee continued up the trail to climb Donaldson, while I veered off to do the short bushwhack to Donaldson West Peak. The whack was immediately terrible. Thick conifers, tricky terrain, and increasing amounts of snow. Even my bone marrow got soaked. I needed a full-on snowsuit and muck boots, possibly an Astronaut Uniform. I was under prepared for the early October winter conditions. It took me 2.5 hours to go about one mile round trip. This bushwhack can only be described as traumatizing marked by forlorn hopelessness and masochistic despair. Snow and branches pummeling me everywhere and drenched feet which are the worst. So cold. As I was departing the summit of Donaldson West a snow squall blew in and it was whiteout conditions for about 10 minutes. It was the bushwhack equivalent of getting run over and then the person backing up over you again to see what they hit. ​​​​​​​I was going to climb North Seward but it was too dangerous, I blitzed down the Calkins trail after the whack and got to my car as quickly as I could. I felt like I had been entombed in ice by a zamboni. Just to rub it in. D-West has 360 degree views. 360 degree views of snowsqualls!!!!!!!!!!! Your wife got a great photo, though!